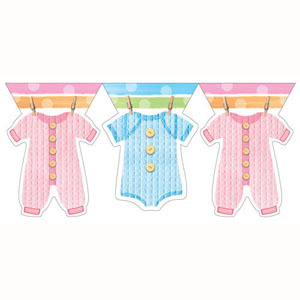 Consider unisex baby shower decorations if you’re having a co-ed baby shower for your circle of friends. Your hubby may shirk at the idea of attending a party, which revolves around trimesters and afterbirths, but you’ll convince him to participate with a few compromises. Besides, co-ed baby showers are the norm nowadays. If your husband took the time to participate in your Lamaze class, then there’s no reason why he shouldn’t invest in a couple of hours in the company of friends. You’re also celebrating the arrival of someone special. You have to consider the other studs in your invited couples. Ensure your baby shower accommodates both sexes so you won’t scare off the men at the first whiff of baby shower games. Your co-ed party is only successful if the men show up, participate, and have fun. Your hubby will feel silly sitting in a circle of female friends, talking about the hair loss and pregnancy hormones. Your baby shower decorations should be discreet. This means less pastels and more muted colors. The party has to be consistent with the theme, though, so don’t leave out staples like diaper cakes, baby clothes, and crocheted sweaters. Think of your shower as a dinner party of sorts. You have to rethink the menu if you want to keep the men occupied, though. You can survive a few hours on cupcakes and juice, but the men need real man-food served on baby clothes dinner plates. You have to consider a beer keg and plenty of steaks. Your hubby will warm up to a shower with barbecue, and his buddies will have more reasons to come over. If you’re queasy with certain smells and tastes, you can arrange separate function rooms for men and women. This should offer space for the sexes to bond in between the party proper. Don’t try to pull a fast one on the guys and force them to play awkward games; keep your intermissions discreet. Couples could pitch in diaper packs for a raffle ticket, and then hand out prizes at the end of the baby shower. If you have to play games reserved for women, then you should let the men fallback to their private retreat and have a couple of rounds of beer and steak. Men are less iffy to a co-ed baby shower if you opt for unisex baby shower decorations; ensure this and the men should have a tolerable evening. 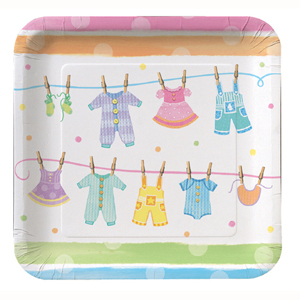 This entry was posted in Baby Shower, Party Supplies and tagged baby clothes dinner plates, baby shower cut out, baby shower game, baby shower supplies, hanging baby clothes on March 29, 2015 by Vanessa Osborne.